And the paper/carton base made me wonder if I could re-use my Duplo solution for this one. It did. The Duplo kept the base in position long enough and I did have to support the car a bit by hand as well to use proper force but it came off! 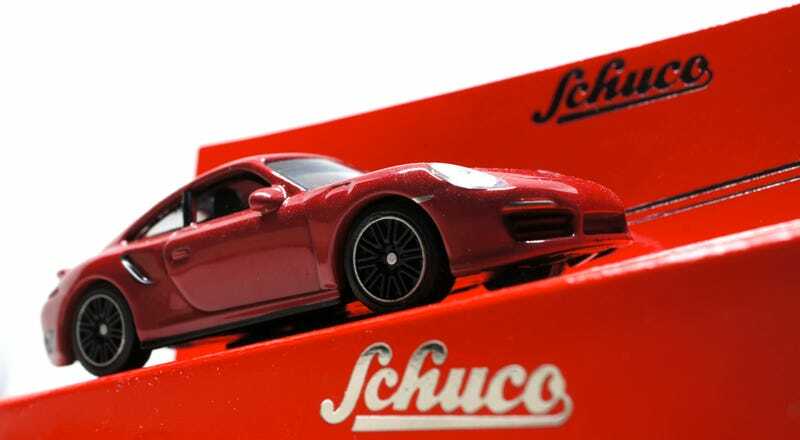 Thus far the 911 Turbo S was the only Schuco 1/64 giving me this problem so I wonder what that is all about. Must be some kind of design-flaw of the undercarriage/interior the screw goes in if two of the two I’ve had had the same issue. But I’ve forgotten it already as it’s gloriously red. Luckily it doesn’t have that thick A-pillar the Schuco 930 in 1/64 suffers from. Glass for all the lights, 4 decent exhaust pipes: The Schuco 1/64-line is definitely premium. Just those front blinkers are painted on but can you really blame Schuco with sizes likes these? No need to tell anything about the 991 911 Turbo S in general as it is a well known sports car. So I just hope you enjoy the pictures and to make clear to you all there’s more premium 1/64 in the world than just TLV and Kyosho. Das war es wieder! Ich wünsche Ihnen ein tolles Woche und hoffe vieles Teutonisches zu sehen heute. Grüss dich!